George Soros is sparing no expense for his September wedding to his third wife, Tamiko Bolton. George Soros, 82, and his 41-year-old girlfriend have reportedly printed about 1,000 invitations for the “extremely color-coordinated” celebrations but have only sent out “several hundred” to family and friends. Guests will be treated to several events in different locations, but won’t have to splash out on a gift for the couple, who got engaged last August. The Daily News reports George Soros and Tamiko Bolton will only use vendors in and around New York City, where the wedding will be held. “All the food will be farm-to-table and the flowers will be in-season flowers. They will not be shipped in from elsewhere,” a source told the Daily News. And the celebrations are expected to have a strict color theme. Tamiko Bolton’s wedding planner was spied meeting with assistants at the Openhouse Gallery on Mulberry St. two weeks ago, and watched models trying on different caterer clothing. “It was a full-on runway show for the planner to decide on outfits for the staff to wear,” the insider said. 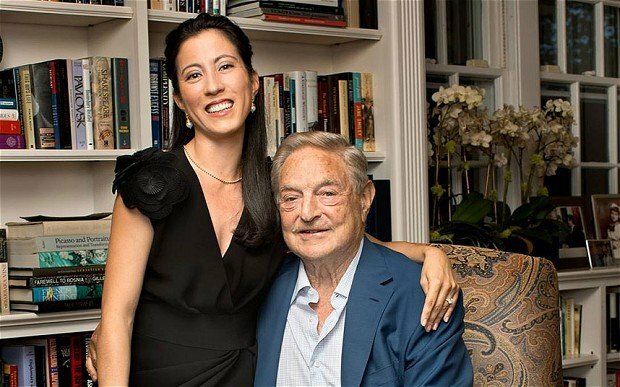 George Soros and Tamiko Bolton, who met in the spring of 2008 and formally announced their engagement at a party at Soros’ summer mansion in Southampton last year, reportedly sent out only several hundred of the 1,000 invitations printed for their big day. “The wedding will be attended by friends, family and colleagues from around the world, including George’s five children and the bride’s entire family,” the source told the Daily News. Despite being treated to the best money can buy, the lucky guests won’t have to give the wealthy newlyweds a gift. Instead guests have been asked to donate to either the National Dance Institute, the Harlem Children’s Zone, the Planned Parenthood Federation of America and the human rights group Global Witness. This will be George Soros’s third marriage and the second for Tamiko Bolton, who was married briefly before. George Soros has five children from his marriages to Annaliese Witschak, whom he split with in 1983, and Susan Weber Soros, who he divorced in 2005. He rose to fame and fortune two decades ago on a now-historic trade, in which he took on the Bank of England and shrewdly wagered on a devaluation of the pound. In 2011, George Soros, an active contributor to politically liberal causes, converted his hedge fund into a family office and stopped managing money for outside investors. Tamiko Bolton, who once started an Internet-based dietary supplement business and is now running a web-based yoga education business, has a masters degree in business from the University of Miami.